This year the Jonathon Beargrease sled dog races were cancelled due to lack of snow in Duluth. (Duluth is getting socked with a blizzard right now--due to get more than two feet of snow by tomorrow--but too late for the Beargrease). The Gunflint Trail hosted sled dog races this weekend--and many folks showed up to race, cheer, and enjoy the festivities. 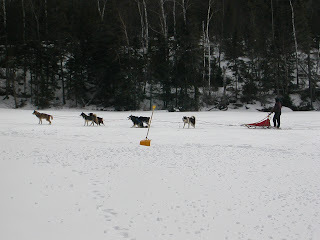 A new winter tradition for the Gunflint Trail?? ?